Chords are the complex sound created by two or more individual music notes. There are an infinite number of chords possible on the guitar, here we will just learn a few basic (and simple) beginner guitar chords. Click to read about guitar fret notes. The first chord we will discover is the E Major chord. The string layout on the guitar allows us to play some of the component notes that make up the chord more than once. The usual way to play the E Major chord is shown here. The numbers indicate which finger you will use to fret that note, (1) is your index finger, (2) is your middle finger, (3) is your ring finger and (4) is your pinky finger (not used in these easy guitar chords however). The O on the left side of the string indicate that string is to be struck in the "O"pen position. Place your fingers at the appropriate frets and strum all six strings together (with a downstroke). Congratulations, you just strummed your first guitar chord! The next chord we will learn is the A Major chord shown here. 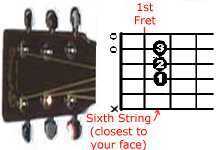 Place your first, second and third fingers at the frets as shown in the picture. 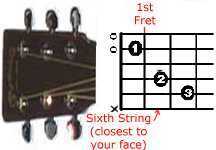 Note the sixth string has an X marked next to it, this means you do NOT want to strike that string. While your are learning you will probably hit that string while strumming, just don't worry about it too much right now. Go ahead and strum the five strings together (with a downstroke), this is the A Major chord. One more chord we will learn is the C Major chord. 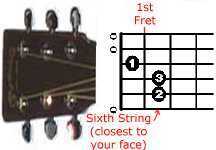 Place your first, second and third fingers at the frets as shown in the picture. This chord also has the sixth string muted (with an X to indicate DON'T PLAY THIS STRING). Again, don't worry if you hit that string while learning. Strum the five strings together (with a downstroke), you have just played the C Major chord. Try these three chords out, strum each chord four times on downstrokes along with the beats of your metronome. Slow and steady, don't go too fast just yet. Ensure the chord sounds melodious, if any fingers are not pressing down properly, or are touching other strings - you will immediately be able to hear the sound of the chord change. After a few minutes of practice, change your strumming to both directions, go DOWNSTROKE UPSTROKE DOWNSTROKE UPSTROKE in time with your metronome beats. Note we are still doing 4 beats (down up down up) for each chord, slowly increase the speed of your metronome by 10 after a few minutes of practice for each chord. A A A A C C C C E E E E and repeat. Note there are four "beats" for each chord, play it with the down up down up rhythm. At first you will have some difficulty in switching between chords, this is perfectly natural. Practice makes perfect, keep your metronome on a slow speed till your fingers get trained. You will find it gets easier with practice, then increase your metronome speed by 10 and keep playing. And most of all, have fun! You are playing the guitar! Next we will learn how to read guitar tab and also how to read guitar sheet music.